This romantic baby blue gown from Isamu Morita is fit for a modern princess! 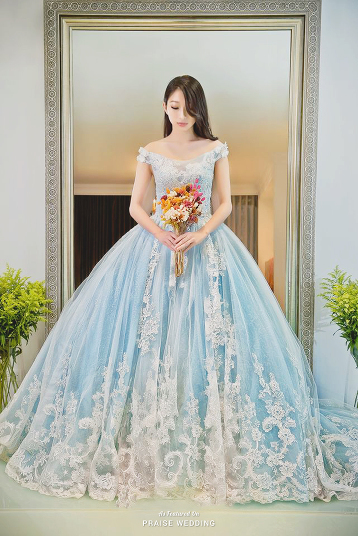 This baby blue gown from Digio Bridal featuring an airy skirt is enchanting us with sweet romance! 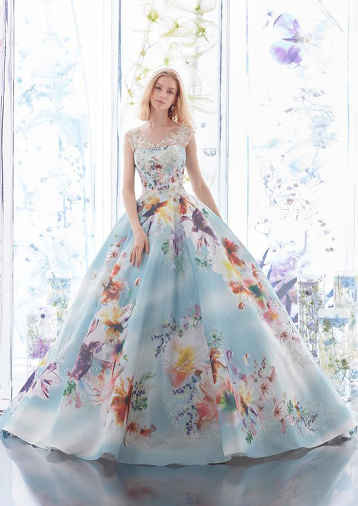 Leggenda Spose presents this baby blue ball gown featuring sweet floral detailing! Falling in love with this vintage-inspired baby blue gown from Jill Stuart featuring romantic lace detailing! This romantic baby blue off-the-shoulder gown from Roman Rolan featuring exquisite floral lace detailing is fit for a classic princess! This baby blue gown from Royal Wed featuring metallic gold embroideries and romantic feather details demonstrates a whimsical spirit while maintaining modernity! For the romantic bride at heart, this airy baby blue gown from The Hany will make your heart dance! 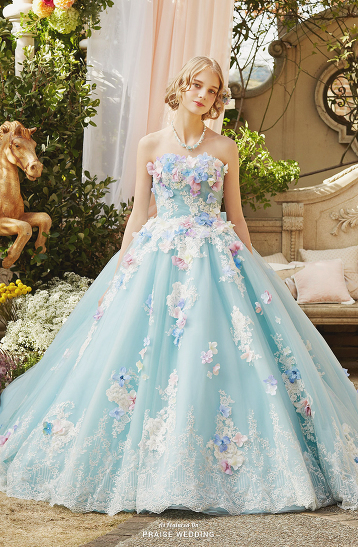 This dreamy baby blue gown from Anovia featuring romantic garden-inspired details is downright droolworthy! 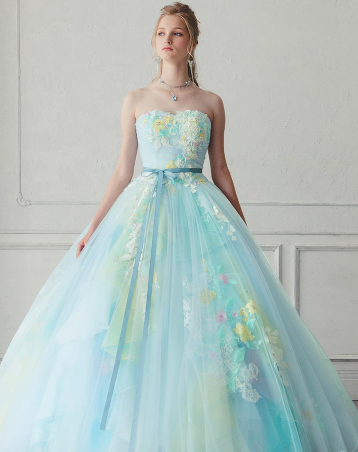 This baby blue ball gown from Nicole collection featuring pastel 3D flowers is utterly romantic! This baby blue gown from Digio Bridal featuring unique silver metallic detailing is a show-stopper! This dreamy gown from Rico A Mona embodies a soft, ethereal feel, featuring delicate baby blue lace detailing! Blending snowflake-inspired lace with soft baby blue tulle skirt, this romantic gown from Lanvin en Bleu is downright droolworthy! 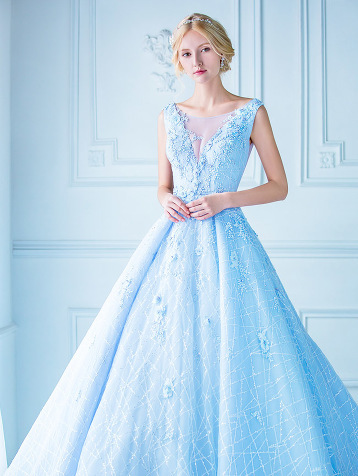 This baby blue ball gown from Belle Lafine featuring a classic lace bodice and romantic tulle skirt is fit for a princess! Lovely baby blue gown featuring romantic vintage lace, this Jill Stuart gown is a sweet and refreshing treat! 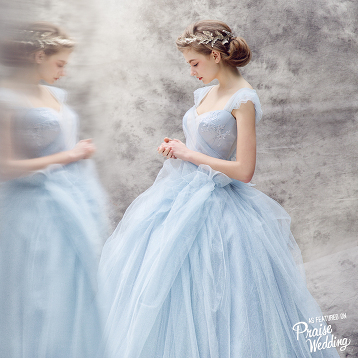 Blending romantic details with a sweet princess-worthy silhouette, this baby blue gown from Royal Wed is oh so sweet! 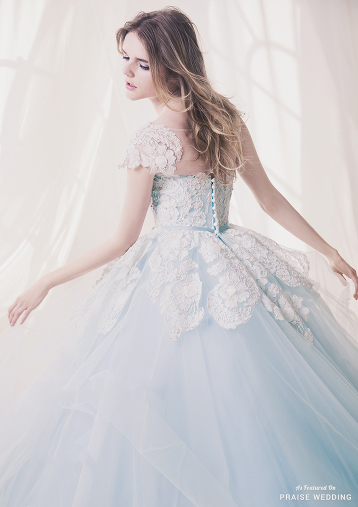 The perfect mix of baby blue x pink, this princess-worthy ball gown from White Link Bridal is utterly romantic! Blending romantic lace with dreamy baby blue tone, this feminine vintage-inspired gown from L’Atelier Mariage is stop in your tracks beautiful! So in love with Angel Sanchez’s 2017 collection featuring classic lace floral pattern with a touch of baby blue romance! 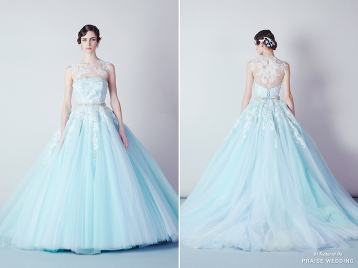 With details that are guaranteed to dazzle , Alba Sposa’s baby blue off-the-shoulder mermaid gown is a show stopper! 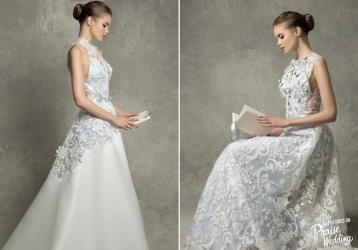 Snowflake lace vs. ruffles? 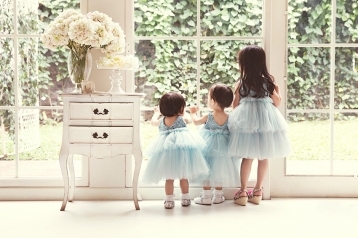 These baby blue gowns from Cinderella & Co. are absolutely adorable! Refreshing prewedding photo featuring an utterly romantic baby blue bridal gown! Baby blue wedding dress with incredibly feminine detailing! 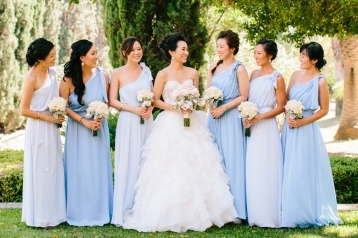 Loving this elegant, rustic atmosphere and the Bride’s lovely blue gown! Drooling over this dreamy mint x white gown! Oh so romantic!